A lapped zipper gives a tailored look. Only one line of stitching shows on the right side of the fabric. It’s easier to keep the stitching straight and to make sure the zipper teeth are completely covered. We prefer the lapped zipper for side openings and sometimes back openings. 1. Increase the zipper seam allowance to 1″, before cutting out your clothing. For example, if the pattern allows a 5/8″ seam allowance, add 3/8″ to the seam in the zipper area. 2. Mark the 1″ seamline at the top of the zipper opening on both the left and right seam allowances. These markings are very important. 3. Stitch the seam below the zipper opening, stopping at the dot that marks the zipper opening and its wider seam allowance. Lock your stitches at the dot by sewing in place several times with the machine’s stitch length set at 0. Press the seam open below the zipper opening. On the left side, fold and press under the entire 1″ seam allowance in the zipper area. Use the marking and the lower end of the zipper opening to position the foldline. On the right side, press under 7/8″ of the 1″ seam allowance to create the zipper underlay. The finished zipper laps left over right. Position the closed zipper under the zipper underlay, with right sides up, placing the bottom of the zipper at the base of the zipper opening. Place the underlay fold next to the right side of the zipper teeth. Make certain the zipper tab extends above the top of the clothing. With short zippers, you shouldn’t have to pin the zipper—you can merely finger pin (hold the zipper in place) and stitch. Pins sometimes create dimples in the fabric, causing uneven stitching. Instead of pins, use strips of Sewer’s Fix-It Tape or transparent tape about 4” apart to position the lap. This 1/2″ wide tape keeps the edge perfectly flat and results in more even topstitching. When you’re finished, you can easily remove the tape, leaving no sticky residue. Position the machine’s zipper foot to the left of the needle. Stitch next to the fold, from the bottom to the top. Lap the left side of the clothing over its right side, matching the markings. Tape the overlap in place. Align a strip of 1/2″ wide Sewer’s Fix-It Tape or transparent tape along the folded edge of the lapped seam allowance. This provides an accurate stitching guide. Slide the zipper foot to the right of the needle. Beginning at the base of the zipper, topstitch along the bottom edge of the tape and up the side. 7. Complete the zipper insertion. Move the zipper pull down into the completed zipper placket. Attach the regular (zigzag) presser foot to your machine. Satin stitch or bartack over the ends of the zipper tape at the top of the zipper reinforcement. Cut off the excess zipper tape. For more information on this technique and my other absolute easiest ways to sew, check out my book and DVD, The Absolute Easiest Way to Sew at Nancy’s Notions. See a collection of blog posts featuring my absolute easiest ways to sew a variety of projects on this link. 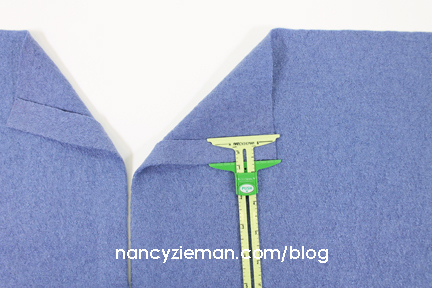 For a chance to win a copy of Nancy’s book and DVD, The Absolute Easiest Way to Sew from Nancy’s Notions, tell us where you would like to use Nancy’s lapped zipper technique. The randomly selected winner of two tickets to Quilt Expo, and four fat quarters is Pat H.
Her comment is: I have enjoyed Quilt Expo for five years now and think this project deserves our support. It is a tribute to Nancy that this work continues. I have camper cushions to recover I will try this on them. Thanks for the give away. I would use this zipper tutorial technique on several dress patterns that I have. It looks very non-intimidating! Any tip on easier sewing for Zippers is more than welcome! Zippers have always been the toughest portion of sewing for me! thank you for offering much- needed help with these issues! Your methods make everything look wonderful, and they make it easy so anyone can Sew! My kids and grandkids are always breaking the zippers on their jackets and winter sweaters. I’v always tried and not succeeded to replace but this technique seems so simple. I intend to share this technique with my 4-H students, and I think this could lead to a great topic for their demonstrations. I would like to use this lap zipper on a clutch purse. I did one in the hoop but wasn’t satisfied with that. So I would like to try my hand at it. Thank you for the opportunity to win Nancy’s book. I always like new techniques that improve sewing. Seems to me this technique would be nice on dresses. This technique would be great for dresses and skirts. I will use it on a skirt and a dress. Great technique and explanation! Thank you. This would work well with some shells I plan to make. Thanks for the inspiration! THE TAILORED LOOK-ALWAYS DID AND ALWAYS USED IT ON MY CLOTHES. I WOULD LIKE TO HAVE THE GUIDE. I would use the lapped zipper on skirts, dresses, and slacks. Having taught sewing for 30 years, this looks like an easy method for all sewists. This technique would be elegant in a side zip on a dress. I prefer side zips i skirts and pants. Nancy’s method makes it easy. I would use this on skirts, pants, shorts, pillows, etc. I love a tailored look that showcases sewing expertise! Lapped zippers look good on dresses. I am currently working on a pair of shorts and this would be a great side zipper method of sewing. I think a beautifully stitched lapped zipper is a must when sewing dress slacks or a skirt, and I would definitely use this method for the job. Cant wait to use this method on a pillow back, but also fleece jackets would be great. Love the technique! I have never had trouble with zippers but am always willing to try new ideas. I will try this out on a fleece jacket. I thought I’d make a couple for fall. My granddaughter repainted her room this summer which means lots of redecorating! She needs matching pillows and I love this application for the zippers. I will use this technique when recovering my rocking chair. Wonderful idea for a skirt or dress zipper! Thank you! I have not seen this technique before. I like it. Am updating my closet and plan to try this technique. I would love to use this technique on a new top that I want to make. I am positioning the zipper under the arm instead of up the back. Many blouses and dresses were made like this in the 1950s to make getting in and out much easier. Loe this application on all sorts of item, from clothing to home dec. I am now using it on AG doll clothes for great grands. Teaching my 7 yr old great grand daughter to sew. Will definitely use this technique for projects. Would like to try the lapped side zipper technique on a skirt as I am planning to make some skirts for the winter. I love this method. I’d use it on clothing like jackets, skirts, and tops. But, I’d also use it on home dec projects. I would like to use the zipper technique on a fleece jacket for the winter. I would use it on a lounge chair cushion. Also want to make a jacket. I also like to use this on pillows as I don’t do much garment sewing. Thank you so much for this tutorial. Insert the lapped zipper in a pillow back, in the center of the seam rather than at the open end/top of the garment. I’ve not found instructions on how to do that. I have only used this method in 7th grade home ec – successfully. I have fumbled with it for the last 50 years. I like the overlapped zipper always – front of jackets, pants, etc. I absolutely do not like the new style of having the shiny zipper going down the back of a dress!!! you for your wisdom and your love of sewing. I like lapped insertion on the side of skirts and pants. Lays smooth. I wish I knew about this technique when I was sewing for my children. I will pass it on to my granddaughter. I would love to use this technique when sewing skirts and blouses.